Who do they honestly think watches rugby? Might not be a popular view but Scrum Vs insistence on having the token female pundit is a bit tiresome. I don't see the issue with Sarra. Knows how to present a rugby show and keep the talk moving and energetic. Needs more Lisa Rogers imltho. 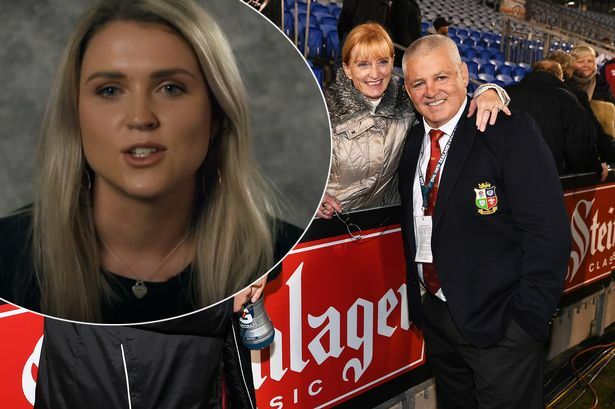 Did anyone see the piece with Warren Gatland's daughter in that BBC piece? I certainly wouldn't mind some guest appearances from her, she is gorgeous Obviously takes her mum's side. I don't mind female presenters or pundits but my absolutely sexist opinion on women in rugby is I don't want to listen to them commentate. Female commentators are coming whether I like it or not but I personally don't think they make good sports announcer's. I can't quite put my finger on what it is but I find it very grating to listen to. Imagine having Jiffy as main commentator for 80 minutes, that's what its like. Its all about having the right octave. Butler has it, McClaren had it. I don't have it, jiffy doesn't have it. Women don't have it. Gatland won't panic, Wales just played poor in the first half as a unit, but i don't think he can make wholesale changes against Italy but take a look at second row and center. I really can't see any reason to make a single change. It's Gatland. There will be 7/8 changes minimum. He always rotates for the Italy game. Could easily be whole new front row, Hill starting in the second row, Thomas Young is definitely in the 23, so a start for him and Wainwright possibly. Biggar in at 10, Watkin in the centre. I'd hope so too. I don't want us to risk damaging any of the first-choice players against Italy. Although I think, weather permitting, it might be more of a game for Anscombe than Biggar. Initially I thought I wanted a B team to keep players fit and fresh, but with the break of a week after I think I'd rather play as near as possible a full strength team, so that combinations are as well tested as possible, and players are ready for the intensity of the England game. The risk of injury is a worry, but I think we have to get on with it, and try and go into the England game with maximum momentum. That said I would like to see Aaron Wainwright start at some point, as much to see what he can do as anything, but at the very least I hope he gets more than a small blast at the end of the game this time. I'm also a little underwhelmed by Samson Lee at the moment - his scrummaging seems to still be mediocre compared to when he burst on the scene, and he doesn't offer as much as Dillon Lewis around the park. One other thing - I've seen lots of pundits praise Gareth Davies for his impact when he came on. Is there anyone here who thinks he was a positive influence on the result? I thought we won in spite of not because of him. I enjoy Jiffy in the comm box. Him and Charlo work well together. Right, and yet he seemed to get credit for being on the pitch when things went well regardless of what he was actually doing. I wish when pundits blather on with a 'Dan Biggar and Gareth Davies really controlled things when they came on' someone else on Scrum V would say 'actually I think Biggar was decent but Davies was poor' rather than just let them witter on. I was looking at Gwyn Jones thinking he might rebut Jamie Roberts when he was doing it...but nothing. Peter Jackson would probably have stuck the boot in....he's not normally afraid to buck the party line. The Clermont second-row revealed he was captain at the time he threw the fateful pass to North - without even realising he had been given the role. He told Midi Olympique that it was only when referee Wayne Barnes asked him what he wanted to do for a penalty that he realised he had taken over as captain after skipper Guilhem Guirado had departed. "I did not even know I was a captain," said Vahaamahina. "It was the referee, Wayne Barnes, who came to see me on a penalty to ask me my choice. I told him to address the captain. He said it was me. "The staff did not warn me." Peter Jackson is a man who isn't afraid to attack the WRU or its employees every day of his employment. He's going to be redundant once the Sospan mafia take their place in the halls of power. Quite what he'll do with himself after the World Cup is anyone's guess as he will have emptied his bucket of bile. Perhaps he'll write a book for Gatland … or a requiem perhaps? I thought he was gash, and said so the next day. And I'm one eyed and red. Welcome BB. Can I ask if you are a regional supporter and if so which one? Also, what is this about the bit in bold? Welcome Carwyn. Same to you. Can I ask if you are a regional supporter and if so which one? I may have asked you this a a couple of weeks back. Great to be here, LOT. Very much enjoyed the back and forth on this great thread by some top, top posters! The best posters! Im a long suffering supporter of the one true reejun...the Dregs. Indeed. On all points ..... nearly. So, how much rotation do we go in for against Italy? Warren G reckoned that Young would see some action, and giving the backow a rest (especially in light of the mountainous task they will have against England) is not the worst idea. The real question for me is, do we rest AWJ? Do we even need to? He's been fairly well rested for the Ospreys this season. Other than that, I think the halfbacks should stay as they are, and maybe bring in Watkin at centre for Parkes. Keep the back 3 as is, and maybe let Dee have a start in the front row. The only thing I want to see is Turnbull run out of town! Has no right being near a Welsh jersey. It's a mark of the amount of depth that we've created that I wouldn't have a major problem with any of our squad starting a game (notwithstanding that I also understand that some are better than others)...but I'd have serious worries if a tugboat like Turnbull was called upon in an important game. Those two are the future though. Unless we are in a real pinch, I don't see what is gained (from building a better Welsh team point of view) by going for Turnbull. Even if we wanted to give the entire backrow a rest against Italy, then I'd go for a backrow of 6. Wainwright, 7. Young, 8. Seb Davies. That backrow actually has more of a chance of being needed at some point in the future. My Cardiff mate is saying the same thing as Theflier. I argued Wainwright, but he says Josh is 2.5 stone heavier. I don't know, Wainwright is the future, but Gats wants to win the 6N and RWC this year, so we'll see who he chooses. If he picks the Blue then we know he leans more towards the Cardiff posters opinions. My Cardiff mate is saying the same thing as Theflier. I struggle to believe there are two people that thick in the world...but I suppose, they are both from Cardiff. You joke, but I'd take any of those over Turnbull. In fact, I'm struggling to think of a backrow player in the regions who I wouldn't take over him. I'm not a fan of Turnbull in the backrow - I'd be happy enough for him to be used as an emergency 2nd row - but he's not fast enough for an international backrow - Wainwright is a much better option at 6. Turnbull shouldn't be in the back row, neither young for that matter, we've enough talent without oldies and men the size of children in it. Seb is a modern day Michael Owen? Give me 1 good reason this shouldn't be the back row for Italy. Because he may want to start with Tips? or move Navidi to 8? and possibly 3 to 4 other options. I think Tipuric and AWJ need a rest. Too important to flog in a game we can win without them. I think we need to put cory and beard in the second row, beard needs to up his workrate it won't do for england, lets take look at young although he would have to play a blinder to oust Tips. Watkin in the center and a tinker with the front row. Tomas Williams needs another crack but need to play a blinder, to ponderous at times and got caught out. So Wail says 8 players left behind and not in Nice squad of 31. Turnbull being one of them. 4 injured, 4 not selected. So there you have it.